Marcus Sedgwick tackles The Third Doctor in this latest Eshort celebrating the 50th Anniversary of Doctor Who. The Doctor and Jo are trying to recover (or steal, depending on how you want to look at it), a mysterious spear in a museum before it falls into the wrong hands. Unfortunately, somebody already has their eye on the spear, and the Doctor decides to try his hand at some time-traveling subterfuge to make sure that he secures the spear before anyone else. Of course, nothing goes right, and Jo and the Doctor are captured, and then escape, and are captured again, and run here and there, trying to escape again. Good lord, there is a lot of running about in such a short story. I know the Third Doctor did a lot of running about in the show, but I guess it just comes across differently when you're watching it on a screen as opposed to reading it on a page. Speaking of the nods to the show, this short is chockablock with them: U.N.I.T., the Brigadier, Bessie, the Doctor's 70s fantastic wardrobe. Sedgwick certainly made sure he ticked everything off the Third Doctor checklist. I'm not complaining! He did a great job with the story, it just seemed like all the things from the Third Doctor were in this short. Good job him for pulling it off! Something else that I've noticed, and I don't know if this was something that the authors were expected to do with these shorts, but so far each author has tied his story into either a previous historical event, a literary event, or some kind of mix of the two. Eoin Colfer let the First Doctor and his adventure be an inspiration for a certain literary character from J.M. Barrie; Michael Scott clearly borrowed many elements from H.P. 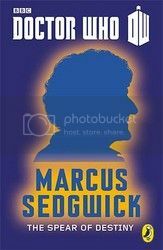 Lovecraft for his adventure with the Second Doctor; and now with his adventure for the Third Doctor, Marcus Sedgwick tries to tie together the fabled Spear of Destiny with Norse mythology. I wonder if this is a continuing theme we'll see as the series of Eshorts will continue, or if these were simply one-off coincidences. The Third Doctor was portrayed by Jon Pertwee from 1970-74. Pertwee's Doctor had been exlied to Earth by the Time Lords, so for the first time we see the Doctor dealing with the same cast of characters and the same locale (Earth) episode to episode. He was a much more adventurous Doctor that had been portrayed, and liked to play with all sorts of vehicular gadgets. I guess since he was locked to one location, they had to come up with something to make the Doctor fun, so throwing a bunch of super-spy tropes the like of which were popular with James Bond made sense.